Theresa May has delayed a decision on whether the UK's first new nuclear power station in a generation should be built. Energy giant EDF earlier approved the deal for the £18 billion Hinkley Point power station but our Business Editor Joel Hills learnt late on Thursday that it was "not all systems go". ITV News' Chris Ship said the prime minister had accepted French President Francois Hollande's offer of more time "to make up her mind". A planned press conference with EDF's chief executive on Friday morning has been cancelled. The Government's shock decision to delay the go-ahead for a new nuclear power station at Hinkley Point - described as "bewildering and bonkers" by the unions - has been defended by a senior Government source. Reporting from Westminster, ITV News Political Correspondent Carl Dinnen said he was told by the insider that the delay reflected the approach of Prime Minister Theresa May to key policies. The government's decision to delay the go-ahead for a new nuclear power station at Hinkley Point has been welcomed by Greenpeace, who said the project could be a "monumental disaster". Speaking on ITV's Good Morning Britain, Kate Blagojevic said: "We really welcome the government's decision to press pause because we believe this project could be a monumental disaster for tax payers and for bill payers. It's so expensive. "The government has negotiated a really sweet deal for EDF and its Chinese partners but it's not a good deal for us - people who are paying the bills. "We believe that the government should be investing all of its efforts into the cutting edge technology that we're getting left behind on while the rest of the world is forging a path towards renewable energy powering all of the countries involved." The decision to delay the go-ahead to build a new nuclear power station at Hinkley Point shows the government is in "absolute chaos", the Shadow Energy Secretary Barry Gardiner has said. Speaking on ITV's Good Morning Britain, Mr Gardiner said: "Originally it was supposed to be that the bill-payer would pay £6 billion over the lifetime of the project but the national audit office has now said that will be £30 billion - so five times what was originally predicated here. "The message it sends out to investors is that the British Government just doesn't know what it is doing when it comes to major infrastructure projects." Theresa May's decision to delay signing a deal to build the UK's first nuclear power station for a generation is "bewildering and bonkers", the GMB union's national secretary for energy has said. Justin Bowden said the decision to put the £18 billion Hinkley Point project on hold puts thousands of jobs at risk. French energy giant EDF gave the final approval to go ahead with the build on Thursday, but the government said it wanted more time to study the details. Theresa May's decision to review the go-ahead on Hinkley Point C is bewildering and bonkers. After years of procrastination, what is required is decisive action not dithering and more delay. This unnecessary hesitation is putting finance for the project in doubt and 25,000 new jobs at risk immediately after Brexit. It is a gross error of judgment and must be reversed. Building Hinkley will not on its own make up for successive governments' failure to have in place a coherent energy policy, but it is a very important step along that road and, as GMB has been warning now for months, the country's energy capacity is already so fragile that if we have a cold winter there is a high likelihood we will experience power cuts. The last minute decision to delay going ahead with the Hinkley C nuclear plant suggests Theresa May "wants her finger prints on everything, wants to be in control", according to ITV News' deputy political editor Chris Ship. Almost immediately after EDF announced it was ready to proceed with Hinkley C, the government announced it wasn't. Hinkley C nuclear power station is now "on ice" as Theresa May is to take more time to make up her mind on whether to go ahead with the project. French President Francois Hollande offered prime minister Theresa May more time to make up her mind - an offer which she has accepted, ITV News' Chris Ship said. Ok. #HinckleyPoint is on ice until the Autumn. French President Hollande offered Theresa May more time to make up her mind. She accepted. The building of Hinkley C - the first new nuclear power station in the UK since 1995 - is "evidently not all systems go" reports ITV News' business editor Joel Hills. The board of the energy company that is set to build the station today committed to building Hinkley C, but Joel Hills reports the government is "delaying final approval". Hinkley C is evidently not all systems go. Interview with EDF chief executive tomorrow am cancelled, government delaying final approval. French energy company gives final approval to nuclear site, in a move set to anger environmental campaigners but delight unions. Campaigners opposed to the planned Hinkley C nuclear power station have continued their protests, as a final decision on the project by French energy company EDF draws near. A small group of protesters gathered in King's Square in Bridgwater, Somerset, on Thursday, some carrying banners dubbing the project a "white elephant". 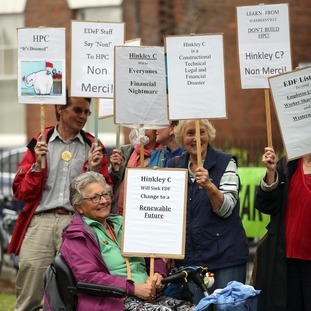 One placard read: "Hinkley C will be everyone's financial nightmare". Allan Jefferey, 64, spokesman for campaign group Stop Hinkley, called on EDF to withdraw from the project. "I would like to urge EDF at their board meeting not to go ahead with what will be financial or commercial suicide," Mr Jefferey said. "They should take a sensible step forward and go to non-polluting energy like the rest of the world."